Monster cookies aren’t anything new. They’ve been around a very long time. 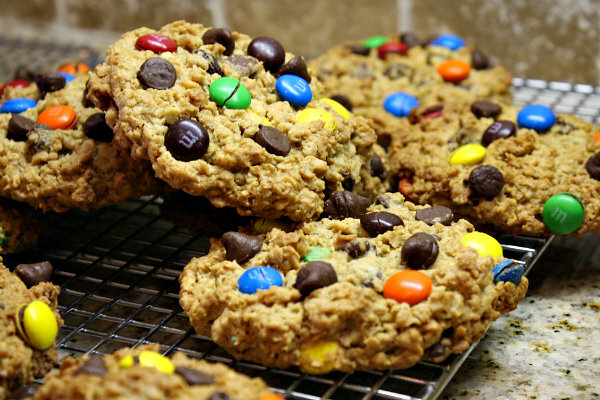 They are basically a peanut butter- oatmeal cookie with chocolate chips and M&M candies mixed in. Just imagine sinking your teeth into these chewy and bumpy like texture cookies. You immediately notice the irresistible duo of peanut butter and chocolate and almost instantly there’s that crunch from the m & m’s. So many beautiful things are going on in your mouth that it’s like having a taste overload. Okay enough talking about it. It’s time to BAKE! 2. In a large bowl, combine the peanut butter with the sugars and butter. Use an electric mixer to mix until well combined. Mix in the eggs and vanilla. Mix in the oats and baking soda. Then stir in the chips and M&M’s. 3. Drop the cookies by heaping spoonfuls onto the prepared cookie sheets. If you’d like your cookies to look pretty (like the photo), dot a few extra M&M’s and chocolate chips on each mound of dough before baking. *CHEF’S TIP – These cookie store great in the freezer. Posted on October 5, 2012, in Lady Fab Cooks and tagged dessert, food, monster cookies, recipe, snack, sugar fairy bake shoppe. Bookmark the permalink. Leave a comment.